The deep insights and thoughtful answers in the book will help you make more informed decisions about your financial legacy. The advice and practical tools will help you get organized, develop a strategy and take real control of your family’s wealth. And the many examples, stories and case studies will show you how other families have handled the very dilemmas you may be facing today. Managing significant family wealth is a complex affair, and successfully navigating the route involves making critical decisions. This book equips you to take positive action, be proactive and make the tough decisions to protect and grow your family’s wealth. When your family’s wealth is at stake, knowledge and sound advice is critical. Drawn from interactions with hundreds of wealthy individuals and their advisors, Wealth of Wisdom provides a definitive resource of practical solutions to the important questions of family and wealth from the best minds in the world. Visit the Wealth of Wisdom Website or order at Amazon.com, Amazon.ca or Amazon.co.uk. 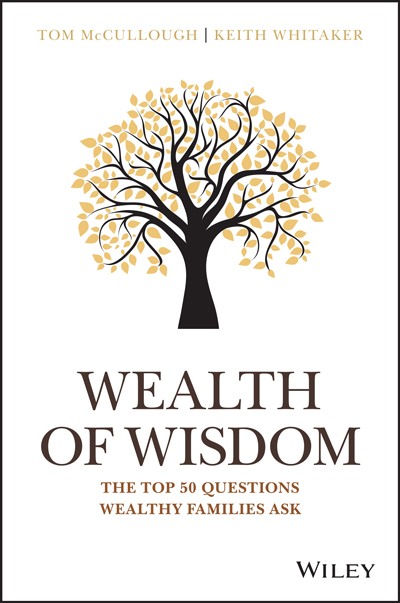 The Wealth of Wisdom podcast is an audio companion to the book. Episodes include interviews with the top global thinkers on family wealth that contributed to the book. Preview online at the book website or download the minibook preview here. Meet authors Tom McCullough and Keith Whitaker, plus the book contributors.